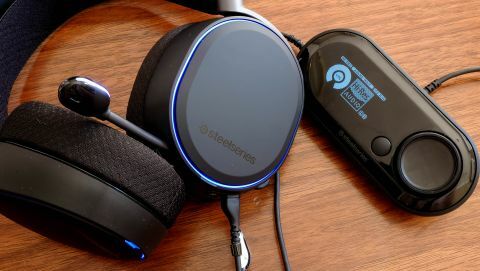 With a classy aesthetic and a stunning sound, SteelSeries’ latest headset is the stuff of aural legend. With its several input options, great virtual surround sound, comfort and control accessibility, it’s a gamer’s dream. SteelSeries, and its gaming headsets, may just be the gaming community’s best kept secret. It basically changed everything, helping to make the best gaming headsets evolve from way too bassy headphones to an audiophile’s paradise. Case in point: The Arctis 7, which has earned plenty of praise and is still one of the best gaming headsets in our minds. Just over a year after the SteelSeries Arctis 7 graced our presence, you may have guessed that SteelSeries has been biding its time to perfect all the small imperfections. And, well, you’d be right – the Danish manufacturer has just released its newest headset, the Arctis Pro – and, we have to say, it’s absolutely awesome. We had the pleasure of taking the SteelSeries Arctis Pro + GameDAC for a test run before its consumer release. And, not only were we impressed by its sound quality and great features, but we’ve also found that it corrects the Arctis 7’s minor issues. However, ahead of Black Friday and Cyber Monday, you should be aware that at $249 (about £180, AU$320), the Arctis Pro isn’t the cheapest headset – but it’s not a bad price for a set of high-end cans. It’s a price we’d be happy to pay for sound this beautiful. There’s only one word for the Arctis Pro + GameDAC’s design: elegance. While its biggest competitors seem to all be designing the most ambitious-looking, gamers’ headsets, it’s bringing it all back down to earth with a simple, minimalist and no fluff design. SteelSeries once again opts for a classy, matte look and an ergonomic design. Its steel headband boasts a gunmetal finish with a padded underside. The swiveling ear cups flaunt removable plates with a coat soft touch paint and athletics-inspired Airweave cushions. It also has a secondary headband that's similar to a self-adjusting ski goggle suspension band, which traces the wearer’s head for a perfect fit. Of course, users can replace the headband and magnetic earcup covers for something a little more interesting, which we ourselves opted for and you can see our customized headset below. You can wear these puppies for a long time without hurting your head and ears. Additionally, because of the removable headband and the removable ear cups, you easily get away from the typical black color scheme and personalize yours with its own line of accessories that come in different colors and designs. To give it that gamer’s look, LED lights run around the fringe of the ear cups and you can customize using the GameDAC. The mic, which twists in any direction and easily pushes into the left ear cup when not in use, has its own LED light that glows when muted. There is one minor detail that we’re on the fence about: the placement of the mute button and the volume dial. They’re both located in the back of the left ear cup, soyou kinda have to retrain yourself when adjusting the volume if you’re a rightie. The upside is, you won’t have to take your hand off the mouse in the middle of a game to do so. The Arctis Pro’s best feature is its digital to analog audio converter designed specifically for gaming. . While most gaming consoles and PCs have their own built-in converters, the Arctis Pro’s included GameDAC will override them as it offers higher quality audio performance. As an extra perk, it also has its own amplifier circuit. We noticed that this feature doesn’t necessarily give the headset a punchier sound than its competitors. However, it does help deliver extremely low distortion at even the highest output levels. This GameDAC, ergonomically speaking, feels kind of in the way. Like an anchor it’s big, bulky,heavy and requires a USB power source. So you’ll never be able to just take the whole Arctis Pro setup and plug it into a phone to get the best audio it can deliver.. But it’s another minor detail we can overlook, especially because of its capabilities. It has its own OLED screen display, which allows you to adjust the volume, EQ curve, input, the Sidetone (how much you hear of yourself while talking on the mic), LED colors, and the ChatMix (the balance between in game and chat audio) without going through a software. It also allows you to turn the DTS on or off with a press of a button to toggle virtual surround sound. One thing to keep in mind is that the when using GameDAC has a maximum volume limiter. When you're going analog instead of using the GameDAC, the headphones are much louder. As far as sound goes, Arctis Pro is a majestic siren. Its sound performance is of the audiophile variety, whether you choose to go analog or digital. In fact, these headset is so good there’s not much difference between the analog and the digital inputs. Analog audio might not but as detailed, but it still sounds fantastic. That says a lot about this unit’s sound quality. Not to say that Arctis Pro is faultless. It’s soundstage, for example, isn’t as wide as some top headsets in the market—Creative’s Sound BlasterX H7 Tournament Edition, for example, has an even more impressive one. Still, it has a very good stereo image and every sound seems to come from the right place. However, the distances of the different elements in a game are not as palpable as they are with the H7. By extension, H7’s wider soundstage makes its virtual surround sound more natural; but not by much. Arctis Pro’s virtual surround sound is pretty convincing , making up for another one of Arctis 7’s shortcomings. While playing Hitman, we could hear voices passing and from behind us; with Dishonored 2, we could hear the guards running up to us before we even see them. Does the DTS button on the GameDAC improve it? In our tests, it doesn’t really improve this existing 360-degree audio image; at least not in an obvious way. It does, however, act as a compression feature with a high-mid bump that pushes voices to the forefront, makes music sound better, and helps with modern movies with terrible sound mixing. Still, it all boils down to the sound. This gaming headset produces an impressive EQ frequency curve. There are no weird bumps in the highs, mids and lows. There are no cuts so whether you’re gaming or listening to music, you won’t feel like there’s something missing. The bass is not overwhelming either (though if you really want to, it can be pushed up through the EQ). The result is a beautiful, well-balanced sound that’s almost worthy of adulation. Sure, we might appreciate a lower price tag. But paying $249 for a gaming headset of this caliber is something we can easily live with. As gaming headsets go, the Arctis Pro + GameDAC is shoo-in for audiophiles and gamers with a taste for nuanced sound. SteelSeries obviously took notice of Arctis 7’s missing features and slapped those on to what it does best – headsets that produce exquisite sound, basically sealing Arctis Pro’s fate as a top contender in the gaming sound devices market. With the Arctis Pro +GameDAC, you’re not just getting a sleek, comfortable design, input flexibility, and a GameDAC that puts control at your fingertips and offer a dedicated, better quality converter. Most importantly, you’re getting mind-blowing sound worthy of audiophile worship.